This is another of those posts that may end up being two parts. It will be lengthy. Can't forget lengthy. Earlier this week I received an email from my kid's teacher saying she wanted to discuss some behavioral issues. Even though the teacher said it was nothing "earth-shattering," I worried for several days until we finally talked. Here is my best attempt at recounting what is going on. My kid, following the heels of negative comments that a couple of other kids made, told a girl that she had no friends. Jordan said the girl made a similar comment back to her, and Jordan insists she then told the girl she was just kidding. This story came from Jordan; the teacher told me that she did not know the details since it happened during another class. I love fall. I love the cooler air. The beautiful leaves. The flavors of fall. Oh, how I love thee, pumpkin. Let me count the ways: coffee, creamer, ice cream, cookies, roll, cake, pie, gobs (or bobbs, as I noticed Giant Eagle called them), seeds, soup, bread. I am surely missing some. Yesterday alone, I had pumpkin creamer in my coffee, pumpkin bobbs (I think I can get down with that), and pumpkin roll. Fall also means the pumpkin patch. For the past four years, my mom, Jordan, and I have gone to Reeger's in Indiana County. I look forward to it every October, and I am never disappointed, though I must admit nothing has topped our first corn maze experience. 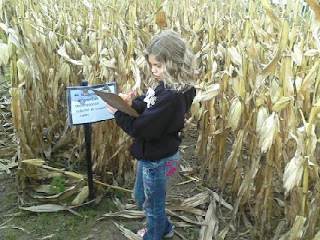 We typically start off at said corn maze, and each year Jordan becomes more and more competitive (hmm, wonder where that comes from), racing to get to the next clue/riddle. This was the muddiest year ever, but still fun. For those of you whom I have not talked to outside of this blog since the end of August, let me start off this post by saying that third grade is difficult. I am only half joking when I say I want to start a support group. I kind of want to end the post here, because if I say everything I want to, this post could rival most of my other ramblings. But you know I won't. The problem is the teacher in me wants and expects my child to do well and understand most everything. The teacher in me thinks that my kid should listen to every word her teacher says and remember them all. Well, at least the words that involve when assignments are due, which books are needed, and what is being covered on tests. But the parent in me realizes that my kid is only eight, and she has had little preparation for the rigors of third grade. When you have three different Simple Solutions books, all white, is it so unrealistic to expect you might accidentally bring the math one home instead of the English? If you provide pizza, I will come. I was really trying to think of a catchy yet appropriately descriptive title for this post, but, alas, I did not really succeed. But here goes the post anyway. You may recall that back in July, I attended a townhall for Raja, who is running for Allegheny County Executive. I came away impressed by what he said and convinced he was the right guy, and not just because there was free food involved. Last evening, for the first time ever, I volunteered for a campaign (Raja's, in case you could not tell where this was going). I and three others from a local Republican group made phone calls for almost two and a half hours to people who were registered Republicans (at least they were at one point in time). The whole operation seemed pretty slick. Let me explain how it works. It is hard to believe another year has passed since the day that probably 99 percent of the women out there dread. Oh, how I loathe my annual exam, but I am happy to report that two things happened to make it not so awful this year. Through the apparently thin walls, I could hear the heartbeat of an unborn baby. I have no idea what that instrument is called (the one that allows you to hear the heartbeat of an in-utero baby), but as I heard that sound from so long ago, my eyes immediately watered. The memories of that whoosh-whoosh-whoosh noise, from over eight years ago, came flooding back, and I was immediately reminded of the first time I heard Jordan's heart beating from inside by stomach. At the time, I had no idea what the sound was, and I had to ask the nurse if that was my baby's heartbeat. She said yes, and my eyes welled with tears. Yesterday I found out a high school classmate had died. Because there were only about 115 in the class of '89, I knew everyone. In fact, I knew almost the entire high school, either by name or by face. Crissy and I never hung out together, but we were always friendly and shared some of the same friends. She was in the marching band, and I was a flag twirler, so during the football season we saw each other more regularly. I don't think we ever had any classes together, and to the best of my recollection, we were never in the same homeroom. But I knew her. She was nice. She was athletic. I seem to recall she was good at softball. We were "friends" on Facebook, so I know that she was an EMS, had a few dogs, loved the outdoors, and had recently moved. A blog I visit from time to time recently had a post about free-writing. Well, that was the part of the post that most intrigued me: Kristen explained how she responded to a simple prompt of "I" and went on to write about herself uncensored for five minutes. As my 40th birthday looms ahead (just over two months), I decided to try this free-write myself. So here goes nothing, off the cuff, from the heart. I worry a lot, about more things than I should. I love my kid and my husband more than anything else. I love my kid more than my husband, and I know I probably should not. I like football and hockey, to watch. I am a Steelers fan first and a Penn State fan second. Once I had a kid, I decided it was okay not to watch too many PSU games, but I do my best to watch all the Steelers games.